Pink silk taffeta with painted garlands; matching stomacher and petticoat. This dress, with its dynamic silhouette, shows a peak of women's court dress in the latter part of the 18th century. The skirt, which widely expanded on each side, just barely achieves balance when combined with the enormous hairstyle. This pinnacle of artificial beauty emptily expressed the authority of the royalty and nobility before French revolution. The lightweight silk taffeta gown and petticoat are adorned by rhythmical, hand-painted garland motif. Until the 18th century, pattern was mainly woven textile in Europe. In the 17th century, printed and hand-painted cloth from China and India was introduced, leading to the creation of new printing techniques in Europe during the 18th century. 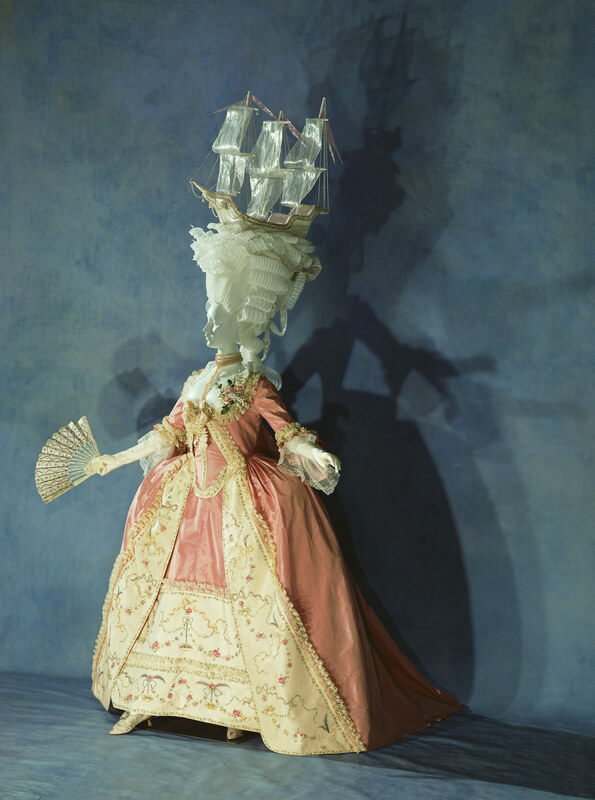 The dress shown here, the last rococo period, shows the craze for dignified silk textiles has already out of fashion, and anticipates simple and light trend of the next period. Also, the coiffures and wigs of this period were enormous in comparison to any other period, and became the suitable target of caricatures. They became odd and extravagant, looking like picturesque landscapes and flowerbeds, and creations such as models of warships, horse-drawn carriages, and fruit baskets were placed on top of wigs. Coiffeurs such as Legros de Rumigny (?–1770) creating these extraordinary hairstyles. Their excessiveness is a sign of the end of the influence of French aristocracy.